Western Reflections Severe Weather door glass has a Florida Building Commission (FBC) component approval, FL14935-R4, that allows it to be substituted in any glazed door or sidelight with an approved missile impact FBC approval or Miami-Dade County NOA. No additional testing is required. Both the original approval and the component approval need to be provided to the building inspector for approval. Severe Weather door glass cannot be used with an approved opaque door impact product to create an approved glazed door. The Wind-borne Debris Region map for risk category II buildings (includes residential dwellings) is shown. The Wind-borne Debris Region authorities accept the TAS tests as well as ASTM E 1996. The Wind-borne Debris Region requires large missile impact protection for all doors and windows below 30 feet above grade. The criteria are less stringent for doors and windows 30 feet above grade and higher: small missile protection is required. 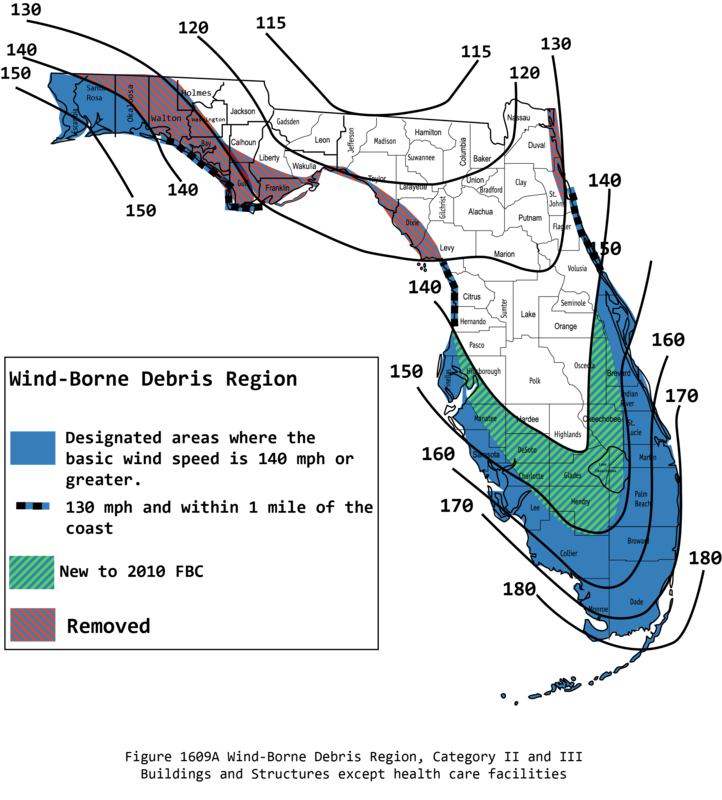 Western Reflections Severe Weather door glass in all insulated glass configurations and sizes is certified for use in Florida's Wind-borne Debris Region and High Velocity Hurricane Zone. Products are certified to meet Missile Level D requirements, i.e., impacted twice with a 9-pound 2x4 board shot at 50 feet/second (34 mph), then subjected to positive and negative design pressures. The High Velocity Hurricane Zone (HVHZ) is Miami-Dade and Broward counties; they require testing to TAS 201, 202, and 203.